Our Anti-Vandal Hardware helps protect your investment in Parking Signs, Neighborhood Watch Signs, Security Signs, Video Surveillance Signs and Private Property No Trespassing Signs that are mounted on either U-Channel posts or Square Posts. IMPORTANT NOTE: When installing, be sure to tighten the break-away nut UNTIL IT BREAKS, which prevents thieves from undoing the nut and bolt, and removing the sign from the post. 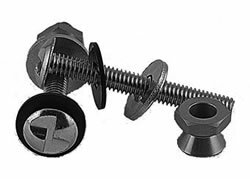 The cone-shaped end of the nut is placed against the washer and the the hexagon shaped end of the nut is tightened until it breaks off, leaving the cone piece to prevent removal of the bolt or sign. Please note that once installed, signs cannot be removed from the post except by cutting the bolt.